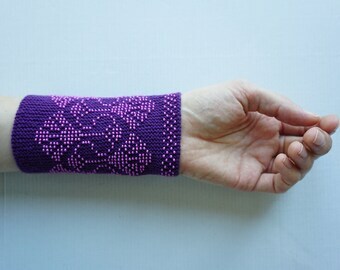 These beaded wrist warmers were created using a 100% merino wool yarn and glass beads. The fabric is very soft, a little fuzzy, durable and warm. Glass beads are knitted in so they won't fall apart. 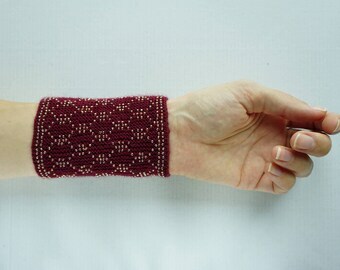 This style of wrist warmer has no hole for the thumb and is designed to be worn around your wrists outdoors or indoors. Simple and streamlined but also featuring intricate glass beads pattern these wristlets will not only keep you warm but will also add instant style to your day or evening look. This unique accessory and particular knitting method was popular throughout Europe in 19th century. The knitted cuffs were worn for practical reasons around the wide shirt sleeves. The more intricate version with patterns made of glass beads were worn for special occasions. Like many fashion trends, knitted wrist warmers are popular again. Today they not only are a part of the traditional national European costumes, but also a stylish addition to any outfit. 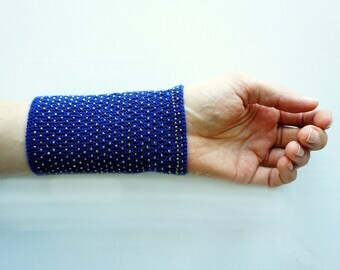 All beaded wrist warmers made by my mum are certified by the Lithuanian Heritage category A badge. The certificate recognises the traditional products and custom made articles produced by a craftsman of ethnic material heritage, made from traditional raw materials by hand or through the application of old or equivalent new technologies preserving unique qualitative attributes and composition of the product. 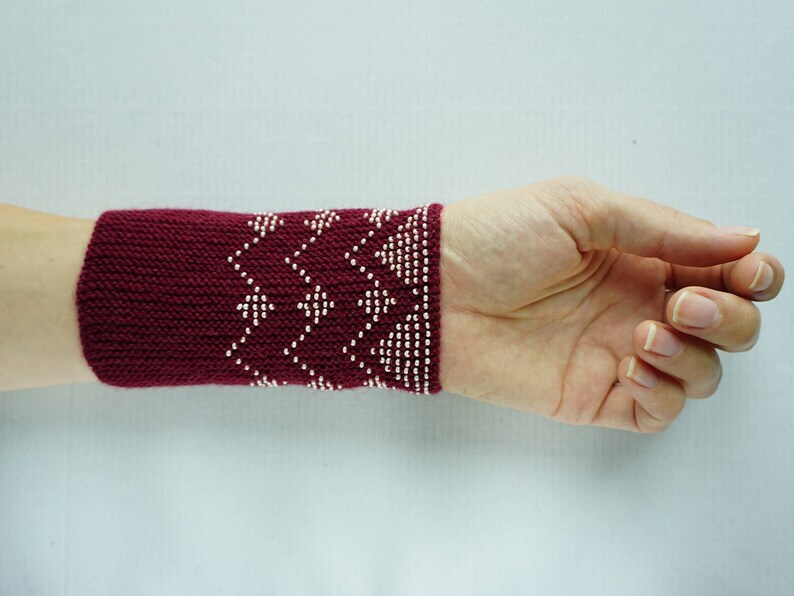 These wrist warmers can stretch to accommodate virtually any hand size comfortably. One size fits most. Hand wash and rinse with cool water // To remove excess water roll in towel gently // Reshape and lay flat to dry away from sunlight // Do not iron. Ready to be shipped from UK by Royal Mail. Handling time is 2-3 working days. Colours of items may vary from screen to screen. Please note that all items are individually handmade, which means that every item is unique and may have slight variances from the photos. Well knit, nicely fitting, and warm fingerless gloves. Very satisfied with my purchase. Thank you. Sehr schöne Farbe und hochwertige Verarbeitung. Sehen sehr elegant aus. Found something you love? Great! Payment is easy, with card, PayPal or Etsy gift card accepted at the checkout. If you are not completely happy with your purchase, please contact me so that we can sort something out. All "ready to ship" orders are shipped within 2-3 working days of order. They travel from the UK via standard 2nd class postal services in the UK or via standard shipping options internationally. Shipping service is provided by the independent supplier Royal Mail therefore Wool and Dot shop is not responsible for any delays to the delivery. Proof of posting for each sent order can be provided to customer upon request. In the case of delayed delivery you will need to wait 15 working days after due date of delivery in the UK (or 25 days overseas) until the order is deemed lost before you can claim exchange or refund. For custom orders, upgraded priority or recorded delivery services please just send me a message to discuss. Lead times, handling times, and costs will vary depending on the item. Request a custom order and my mum will make something just for you.